The method for reviewing clusters for problematic trading activities are unique to each type. The chart shows activity based on order volume over time, but does not show the order prices and liquidity. Looking at the prices for the potential spoofing orders can help you determine whether the trader was placing those orders far off the market in an attempt to deceive traders. From the Cluster Scorecard, you can click Market Replay to show how the orders interacted with the market at the various price levels. The chart at the bottom of the scorecard can give you visual clues about the abusive messaging pattern. For example, the chart in the following scorecard is for a cluster with a high percentage of high-rate messages over a very short time period. In just over five one-thousandth's of a second, the trader submitted over 25 order messages, 100% of which were considered to be submitted at a high rate. The meter indicates this cluster has a risk score of 100. 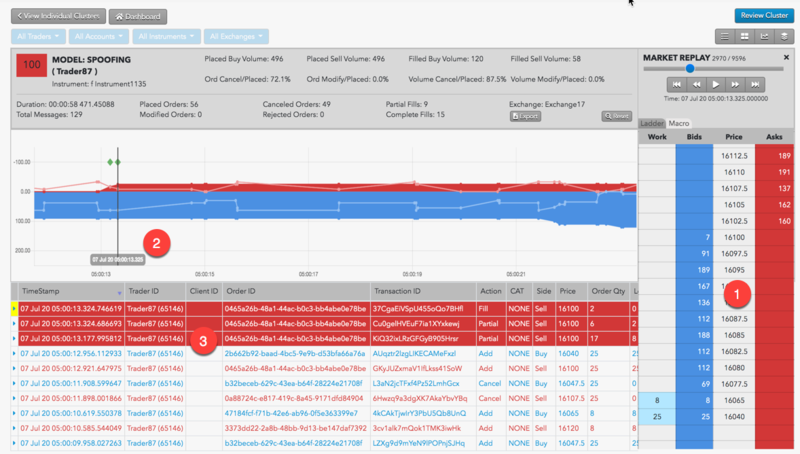 The Burst Chart shows that for the first six-tenths of a second, the trader submitted messages at a rate of nearly 5,000 messages per second. 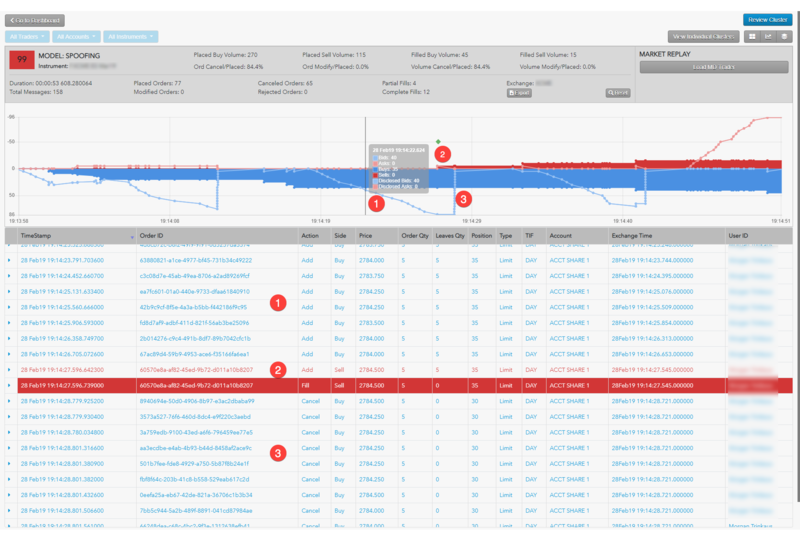 Use the Cluster Scorecard to get a closer look at the activity that triggered the wash trading score. The Cluster Scorecard shows activity that could constitute a wash trade. 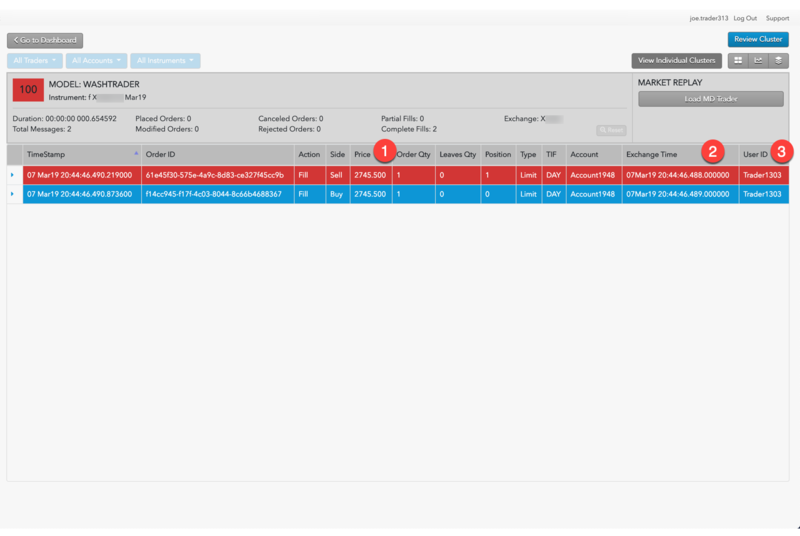 The two transactions were executed by the same trader ID. Quantity filled on the opposite, or profit-taking, orders. 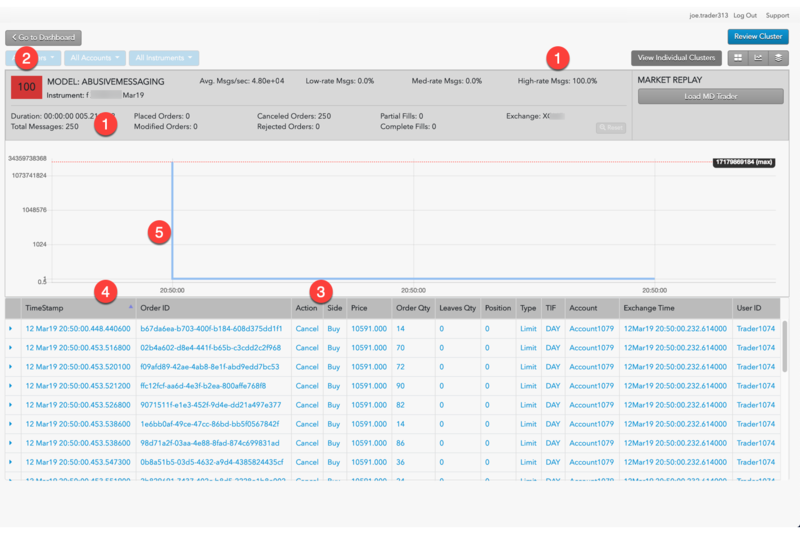 The activity can then also be replayed with the Market Replay on the Cluster Scorecard. Review the audit trail for the creation of a series of small new orders at various price levels followed almost immediately by cancel events. Compare the fill price of the final large order to that of the fill of the last small ping order. If the final large order filled at a better price than the original small ping orders, then it is likely that an abusive pinging occurred.